Looking for Satellite Telephones ? ASIM NAVIGATION INDIA PVT LTD.
Main Products : Video Door Phone, Ip Video Door Phone, Satellite Master Antenna Television System Etc. SHENZHEN LOCKTEL NETWORK COMMUNICATION TECHNOLOGY CO., LTD.
With the evolution of satellite technology to deliver phone, television, radio, internet connectivity and many other services, travellers today are now capable of sending and receiving fast and reliable video, data and audio content regardless of distance. Probably the largest area of satellite usage is the telephone market. Satellite Phones have actually been around for quite some time, but till recent times the costs were mostly too restrictive for the casual traveller. Satellite Phones were first introduced in the 1990's. However, sales were not good as a variety of problems were encountered by the Satellite Phone companies. Satellite Phone, also known as 'Satphone' is a mobile telephone system which allows communication via communication satellites that moves around the earth's orbit for worldwide telephone coverage. These days however, the price of Satellite Phones has been reduced dramatically owing to the fact that the popularity of them have increased. All Satellite Phones allow communication to the standard telephone network i.e. direct dial voice, fax and data communications from anywhere to almost all corners of the world. 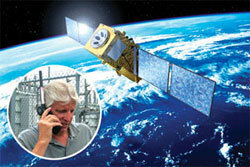 Some Satellite phones also offer GPS tracking and location facilities. Each have different features and some have different options like fax, data or Internet, but predominately, travellers use hand-held Satellite Phones. A Satellite Phone is the ideal communications solution when traveling in parts of the world that are outside of cellular coverage or in areas with inadequate landline service. There is no limit to where you can communicate with a portable Satellite Phone. Satellite Phones provide coverage across all ocean areas and all land masses, giving one the reassurance that one can always stay in contact with home and the office. The Satellite handset is dust, shock and water resistant, able to withstand rugged environments. This makes it well suited to a wide range of business sectors such as industrial services, mining, heavy construction, oil and gas, aviation, forestry and the military/defense. A Satellite Phone is also ideal for staying in contact while sailing or cruising the high seas. 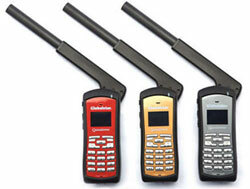 Satellite Phones are usually categorised as Installed, Laptop and Hand Held. There are two types of satellite phone available according to the types of satellites that are being used for its functioning. 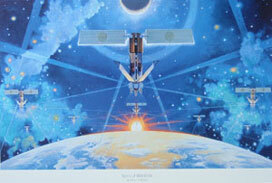 (i) "LEOs" (Low earth orbiting satellites) circle the earth at a low altitude. The handsets are light and small, but the system and phones are complex to manage. LEO satellites are in lower orbits. This means they don't appear as stationary, but instead are moving relative to the earth's surface. The height of a LEOsatellite can vary from an altitude of mere 215 miles to about 11,000 miles. 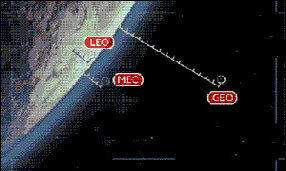 LEO orbits can be polar, with the satellites circling around each pole or any other type of orbit. Polar orbiting satellites clearly fly over the entire world over time, whereas non-polar orbiting satellites don't reach to the very highest and lowest reaches of the earth (the Arctic and Antarctic regions). (ii)"GEOs" (Geo-stationary orbiting satellites) orbit the earth at much higher altitudes in a fixed position relative to the handset. Although GEO phones are bulkier and there is considerable delay in transmission, they are much simpler to manage and work out cheaper. 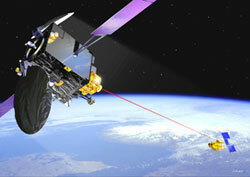 Geosynchronous satellites are at a fixed height of about 22,300 miles above the earth's surface. At this height, the satellite rotates freely around the earth at the same speed as the earth is rotating, so the satellite appears to stay fixed in the same spot in the sky. Geosynchronous satellites are located directly above the equator, and one satellite can cover just over one third of the earth's surface. However, it is common for such satellites to have directional antennas, limiting the areas they provide service to, and saving precious satellite power in the process. » Friends, family and colleagues can send a text message to one's satellite phone at no cost to you or them. Travellers need a communication system that they can rely on. Since satellite technology has evolved and is now a realistically priced solution for communications, there has been a insurgence of the use of Satellite Phones in business, education and recreation. The uptake of satellite technology is most obvious in the tourism sector, with hand-held satellites easy to use, easy to obtain, and providing a reliable, private, communication service to users. Satellite phones are best suited to people who wish to enable other people to make direct dial voice calls with you whilst you are traveling, Call charges are still a little higher than regular mobile phone charges, however the use of the satellite phone would be limited to essential communication only. Most Satellite Phones have a voice mail box and some are SMS enabled. Today one of the most appealing features of the newer Satellite Phones is the dual-mode functionality in some handsets where both GSM and CDMA modes can be used. This means that you can own one handset that can be both your mobile phone and your Satellite Phone. This is particularly useful because with the improvement in mobile coverage one can use the Satellite Phone in a remote place, while the same handset can be used for day-to-day social and business use back home. The way cellular phones work, they use zones or small base stations called "cells" . As one moves from one area or "cell" the call is "handed off" from the old to the new cell. The switch to the new cell is accomplished by the sending of a special signal to the mobile unit. The Mobile Telephone Switching Office (MTSO) connects the cellular calls with the Public Switched Telephone Network (PSTN). The MTSO also controls all the cell sites. All the cell phones are registered with the control channel so the system knows where to find the cellular phone. In a perfect cellular world the cells or zones will look like a large honey bee cone that covers the planet. But this is not possible. It is not cost-effective for the cellular providers to put up cell towers in rural or geographically barren areas. So places where a user is not close to a cell tower or a cellular phone does not have coverage the cell phone will not work. There is also the issue where one's cell phone may work in an area and another's does not. That is because their phone is most likely using another cellular provider that uses a tower with a different technology other than the technology compatible with another phone. Also it would be impossible to place towers out in the ocean far from land, again making cellular phones worthless when not close to a cell tower. Satellite Phones do not use cells or cell towers. The most popular hand held Satellite Phones use Low Earth Orbiting or LEO satellites. When one turns on the Satellite Phone the signal goes up to any number of satellites in a compatible constellation where it is then registered with the constellation. When making a call the satellite signal goes to the satellites and this it is directed down to a ground station or gateway where it is directed by the gateway the to the call destination. The call can be directed to a land-line or PSTN as well as a cellular network. The reverse is also true. Any land-line or cellular network can call Satellite Phones. The Gateway processes and takes care of the switching of the calls rather than the satellite network. This allows one to use the phone even when you are in the middle or nowhere far from any cell tower. If one calls another compatible Satellite Phone, the call is transmitted up to the satellites and then down to the ground station and then transmitted back up to the satellites and again then down to receiving Satellite Phone. This is the ultimate secure calling because the encryption is handled at the ground station as the call never goes to a land-line or PSTN. In short, the main difference between a Satellite Phone and a mobile phone is that Satellite Phones transmit signals to the nearest satellites in outer space while the mobile phone transmits signals to the nearest earth bound cellular network. Satellite phones are not an alternative to regular cell phones, but are intended as an alternate communication system for when and where cell phones don't work. Maybe one can happily live one's life without always having a working phone. But if one is traveling or venturing out, one might appreciate the safety benefits of always being able to call for help if something should go wrong, and in turn, always being reachable by friends and family should that be necessary too. Satellite Phones ensure that you have a global presence. No matter how far your travels take you, it makes sure you can interact with colleagues, family and friends at all times. Satellite Phones keep you connected anytime, anywhere.